Twin octagonal cigar box labels 4 1/4 inches square. I got the GREAT MARK (Sam Clemens) first a long time ago and GREAT MISSISSIPPI some years later. They appear to be around vintage 1910 or thereabouts. 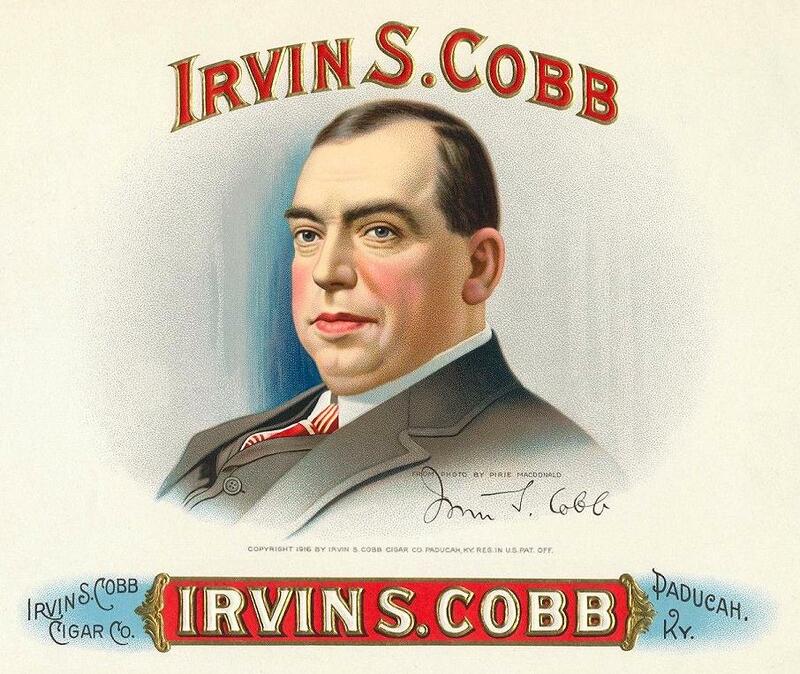 Irvin S. Cobb cigar box label. 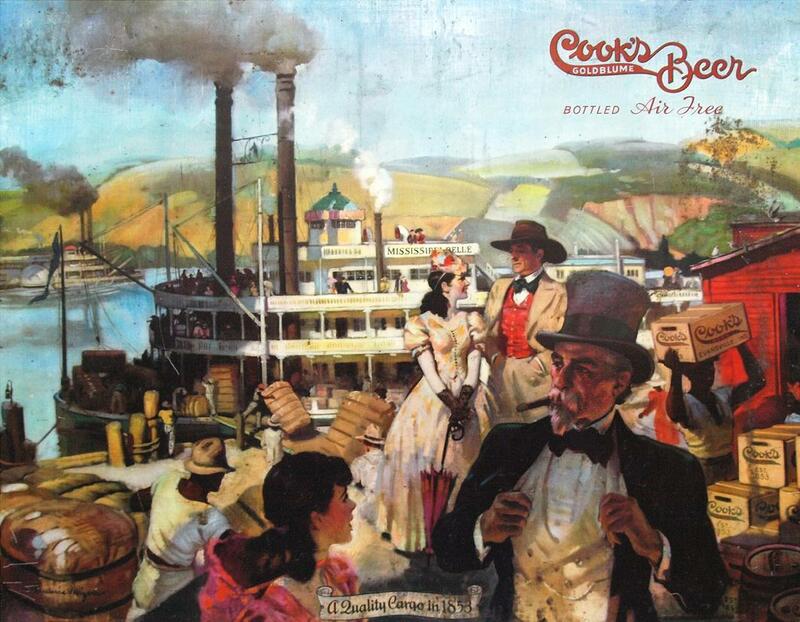 Cobb was one of the stars in Steamboat Round the Bend. The cigar manufacturer chose the Steamboat Grand Turk for the cigar band. [See illustration above.] In addition to this version with a red background (XII 101) this came with 3 other versions blue(XII 102), brown (XII 103) and green (XII 104). The red one was not only in the best condition it was also the best looking of the 4. The illustration (with "full moon") is based on a daytime photo of the Gordon C. Greene that we have in one of the old photos sections. Printed on tin . . . looks like late '40's early '50's. Not in the best of shape but Photoshopped out many blemishes except for the ones that are obvious here. On the crates lower right can be read "COOK'S EST. 1853" & "EVANSVILLE, IND." Was for sale on Etsy (no longer available). Cylindrical cookie tin with the J.M. 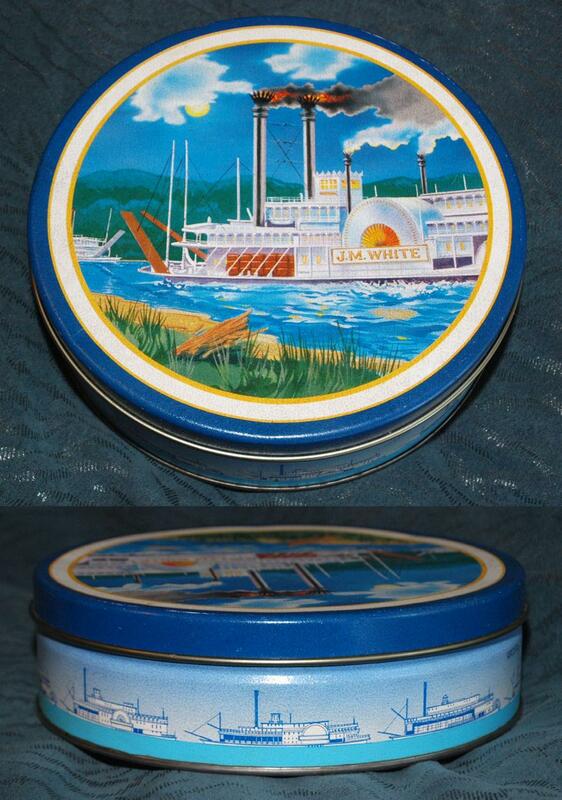 WHITE on the lid and profiles of sidewheelers and sternwheelers on the sides. Dimensions 6 1/2 inches in diameter by 2.80 inches high. Guesstimated as 1950's or '60's? Serial number printed on the side: A8031031. 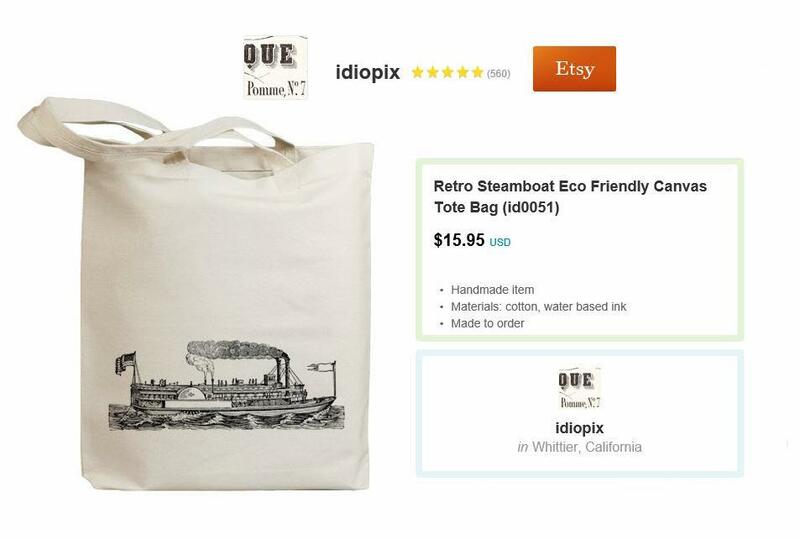 The style of the painted commercial art illustration on the lid suggests that it may have also been reproduced on in rectangular, uncropped format on playing cards and jigsaw puzzles etc. The precision of the 3 drawings of 2 sidewheelers and 1 sternwheeler in port side profiles is actually more pleasing aesthetically than the relatively gaudy and conventional style of the painting inside the circular vignette on the lid. 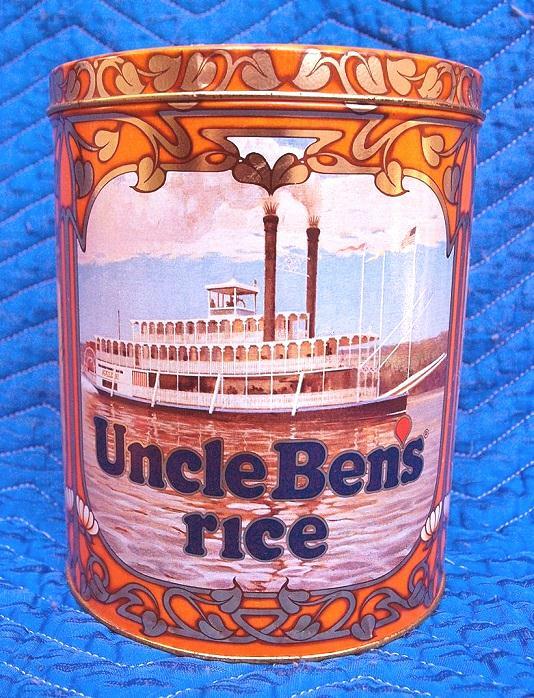 A fairly common Uncle Ben's Rice container circa 1983 commemorating the 40th anniversary of the company. The steamboat is obviously based on the JULIA BELLE SWAIN but the name at the stern was painted to be incomprehensible. This image is from an eBay auction from a while ago. 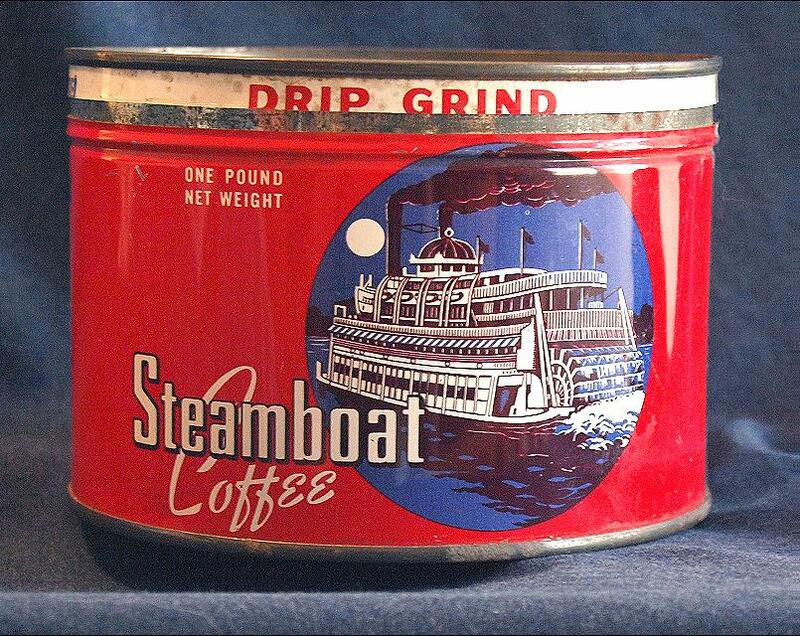 The "steamboat alarm clock" itself was O.K. but the best thing was the graphic on the box. 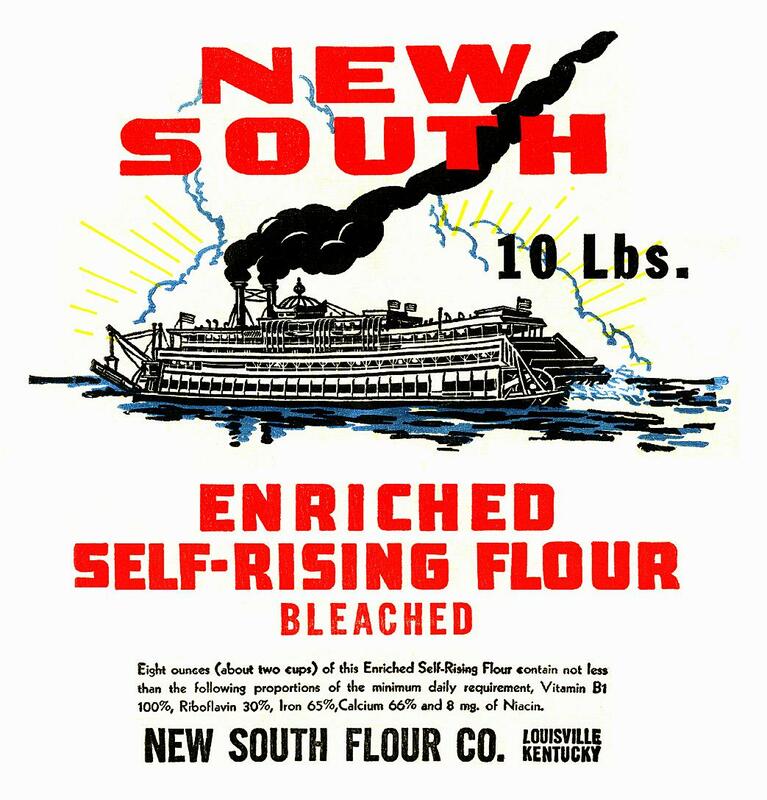 You will recognize the boat as being the same one in the monochromatic image that I sent you scanned from a playing card, the designer of which obviously lifted the graphic from this box. As you can see it's a good deal more interesting in full color. The starting price on the clock was extravagant so I did not bid on it but am glad they included some images of this graphic in the listing. 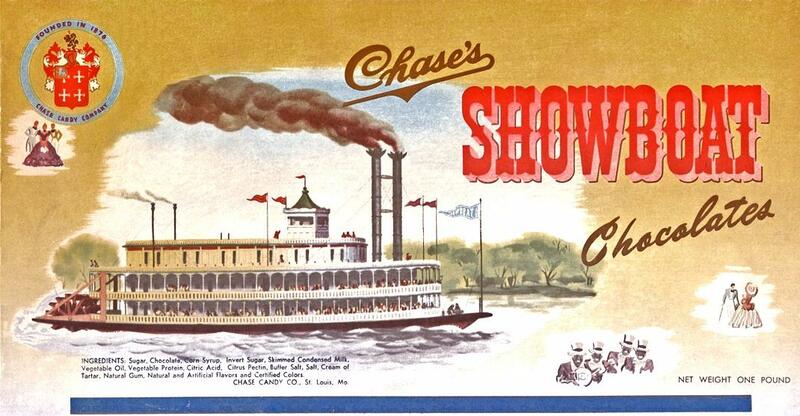 This St. Louis candy manufacturer chose a "river icon" ("Showboat"/Steamboat) as the graphic on this mid 1900's candy box"Founded in 1876 Chase Candy Company Chase's Showboat Chocolates"
Measures 12 inches long by 1-1/3 inches high.